The wonderful site iThinkDiff.com has some very nice (and very free) Windows 7 themes for you to try out! Good stuff. Personally, I use the “Streams of Light” theme on my work desktop. If this kinda stuff floats your boat, you might want to check out the ‘Engineering Windows 7’ blog. Pretty interesting stuff about how and why the Windows 7 team has done things the way they’ve done them – for better or for worse. Enjoyable reading, and not too technical. Honestly. My continuing experience with Windows 7 (Beta 7000) continues to be very positive. Not perfect, but positive – and I am more than ready to move on from Vista to Win7. Funny thing, though… my Vista experience has personally been quite good, but I can see very clearly how Win7 is better in a whole lotta ways. 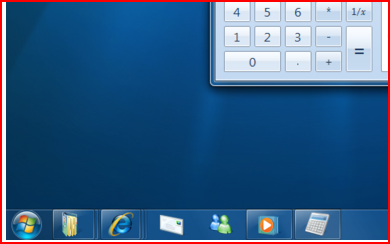 The screen capture (above) show a few things about the new Win7 taskbar (dubbed “Superbar”). First of all, the default taskbar view has all program icons – whether active or inactive – as just icons. No text to the right. As you can see in my screenshot, though, my active programs have descriptive text, and they’re “more visible”, if you will. The inactive (not launched) programs are still just icons only, which is fine. Even better, we have a choice in this. Not everyone will like the default view, and this option is a good go-between. One of my favorite things about Windows is that you have a full-customizing abilities. Make it your own! I’ve seen some wacky Windows setups – and that’s fine. Ever seen an iPhone? How different to they look from one another? Not very. There are always issues giving “too much leverage”, of course, but I appreciate the option. If I have a dislike about this setting, well… it’s that my icons are shifting around all the time. With the old-school “quick launch” area, I always knew where my Outlook, Firefox, and Zune icons lived. With this setup, however, they shift as programs open. With nothing open, my Zune icon is fairly far left. With Outlook and Firefox open, though, my Zune icon is nearly in the middle of my taskbar. Ideal? Perhaps not…or it’ll just take some getting used to. Secondly, my file copy “progress” shows up on the taskbar itself, which is really great visual feedback. File copy processes typically get lost behind your other windows, and thus easily forgotten. I would *love* to see this type of feedback worked into other programs: FTP clients, CD/DVD burning, Windows DVD Maker, or anything. Thirdly, my currently selected window is identifiable as the “gray” button on the taskbar. I like the visual feedback here, but it’s almost too noticeable for me. Also, to my eyes the text is somewhat more difficult to read. Perhaps that’ll change a bit before the final release. So, I continue to enjoy my Win7 experience – and so are many others, if the feedback is to be believed. Also, the interest in Win7 is quite phenomenal right now! It seems that a lot of folks really want Microsoft to succeed with this release. Count me as one of them. Unless you’ve been living under a rock, you’ve most likely heard at least something about the recently released Windows 7 Beta from Microsoft. Since we’re MSDN Subscribers at my work place, I was able to grab a copy of it a day or so earlier than the general public. Good thing, too, since the traffic essentially brought down the beta download sites for about 2 days! Anyhow, I just wanted to give a quick run-down of my Win7 experiences thus far, having installed it five times already. Before I had a decent physical machine available to install on, I went ahead and created a Virtual PC instance running Windows 7. I was somewhat discouraged, I must say, as the install took about 2 hours to complete. Not only that, but Win7 runs fairly slowly as a virtual on my work PC. Slower than Vista in a virtual? Hard to say. Perhaps about the same. I was commissioned to wipe/reload a Sony Vaio laptop with a new OS for a co-worker of mine. I decided that this laptop needed Win 7 (64-bit), and off I went. VERY MUCH to my surprise, the entire install took just 29 minutes from boot-to-desktop! That is pretty astounding, actually. I decided that I could live with a 32-bit install of Win7 on this laptop, so I set out for another shot at a 29-minute install… and that’s exactly how long it took! This time, though, Win7 was able to find every single device on the laptop and supply the corresponding drivers. Nice! Anyhoo… the Vaio was cruising along with a 32-bit install of Win7, so I promptly joined it to the domain, loaded Office 2007, and handed it off to the user. So far, so good! My home machine is more or less considered to be a “dinosaur” at this point, and I had a similarly-spec’d machine at work that wasn’t being used for anything any longer. I grabbed a Dell PowerEdge 400SC (2.4ghz P4, 1gig RAM, 40gig HD) and started a Win7 install. Again, to my surprise, the install took just about 30 minutes to complete – even on a older machine! The video card was pretty sad, so I added a slightly-more-advanced AGP card to enable the fun n’ funky Aero interface for Windows – transparency and all that. Everything else was working fine, and the box really moved along at a very respectable clip! Nothing to sneeze for a 4+ year old computer, running a next-gen OS in “beta” form! Well… I couldn’t take it any more. I just *had* to install Win7 on my work desktop machine, which probably seems crazy to some. Had the previous installs gone poorly or the “word on the street” been less-than-positive, I wouldn’t have attempted such a thing. As it was, I was already thinking about wiping my desktop machine to install Vista 64-bit, so a Win7 64-bit install didn’t seem like too much of a stretch. Without sounding like a broken record, the install once again completed in just under 30 minutes – and all of my devices were present and accounted for. 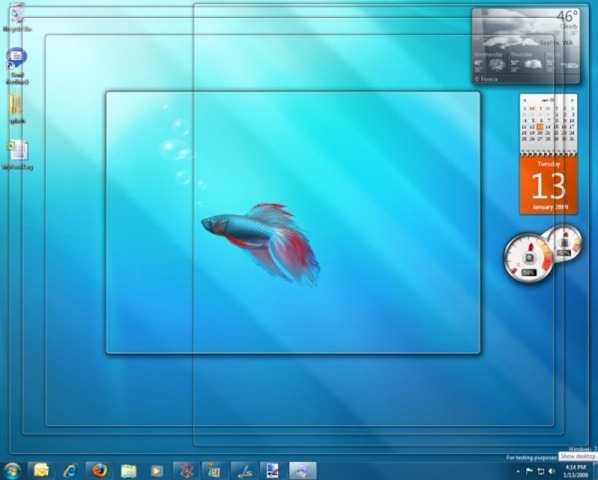 After logging on, you are greeted with the clever “betta fish” desktop. This also happens to be the first 64-bit OS that I’ve ever run for my personal desktop, so that’s strangely exciting. SO HOW HAS IT BEEN SO FAR? Had I not been a Vista user for quite some time, now, the UI in Win7 would’ve been a bit of a surprise, followed by a learning curve. That said, Win7 does offer some very nice updates to the user interface – primarily around the Taskbar and Start Menu. The new taskbar – dubbed the ‘Superbar’, for whatever reason – defaults to using icons for both your shortcuts and currently opened applications. Hovering over the icon of an open application gives feedback in the form of a nice color that moves with your mouse. Also, you get a small thumbnail view of that application window, that also happens to show real-time data from that window. The thumbnail of a WMP session watching a DVD would show the movie running within the thumbnail. 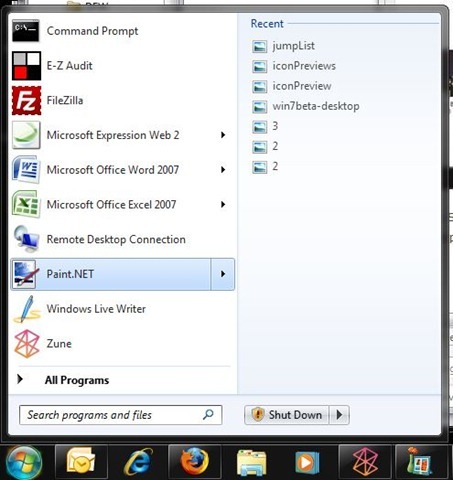 For many windows within a single app, hovering over the icon will reveal all of those windows laid out side-by-side. They can, of course, be selected or closed from that view. Right-clicking on an icon in the taskbar brings up something called the “jump list” – essentially a quick way to do certain tasks. You can always select or “pin” an application using the right-click method, of course, but it gets more exciting with apps that are pre-disposed to “jump list” behavior. For instance, I can right-click on Microsoft Excel and easily access my recently opened spreadsheets! Ever more exciting (for me, at least) is the ability to “pin” certain documents to that menu so that they’ll always show up right there. Have a half-dozen spreadsheets that you access all week long? Just pin them to the jump list. Nice! The Start Menu, although not drastically different from Vista, features the same “jump list” information, which is great. I’m still getting used to how everything works together with Windows 7, but so far I’m really enjoying the UI enhancements! WHAT ELSE DO I LIKE? Explorer and browser icons that show your download/copy progress on the icon itself. Nice!! Much less invasive OS overall. Fewer distracting notifications, kinder UAC, and so forth. WHAT ELSE DO I NOT (SO MUCH) LIKE? IE8 Beta was causing some system-wide sluggishness, it seems. I like the browser well enough, but I had to install Firefox to operate normally. UPDATE: This is a carry-over issue from Vista that has to do with security and the UAC. There is a reg-fix that resolves this issue, or turn of UAC (not recommended). Hovering over the Start button makes it look like it’s on fire. I don’t dig the visual much. Upon booting up today (evidently some “updates” had been installed, and then my computer restarted), my screen resolution was bumped down to 1024×768. Aggravating. Some graphical hesitations here and there. Might be a “beta” display issue. Some system “freeze” type hesitations in strange places. Went to select a screen-saver this morning, and the dialog box froze for a few moments. So far, my Win7 experience has been more positive than negative, and I *do know* what a “negative first-time-using-a-new-OS” experience feels like. Trust me. Moreover, Win7 is really an amazing accomplishment already, and it’s only at a “beta” stage right now. Here’s hoping that Microsoft continues to hunt down the lingering issues, tackle them, and then releases a ready-to-use Win7 sometime later this year! Whether warranted or not, Windows Vista is viewed upon quite poorly in the consumer & business markets. Windows 7 needs to hit it out of the park and get back into the good graces of users and businesses everywhere. Say it with me, folks: Windows Vista *does not* equal Office 2007. Repeat it again (and again). Everyone got it? Please pass along the news. This is important. Why the rant on this, you ask? Because the “uninformed” have officially driven me nuts with this. Yet another co-worker of mine was stating that “he really thought Vista was fine, except that the new Word was hard to get his arms around.”. It was clear during the conversation that to him Windows Vista and Office 2007 were one-and-the-same. They are not, folks. They are not. 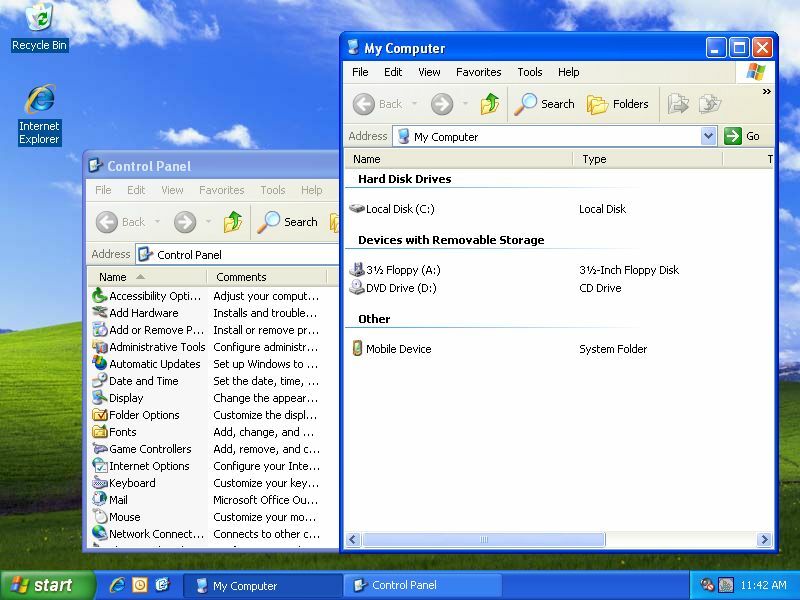 You can use Vista with Office 2003, if you like, and you can use Office 2007 with Windows XP. They are not mutually inclusive. I promise you. The bigger issue here, perhaps, is that Microsoft unveiled two major upgrades at the same time, and that might not have been the wisest idea. When your OS (Windows) and your Productivity Suite (Office) both have 90%+ of the market share, even small changes are noticed by a whole lotta people. Big changes, such as in the case of the Vista and Office 2007 releases, are felt that much more. In my opinion, the pill may have gone down easier if the releases had been staggered a bit better. 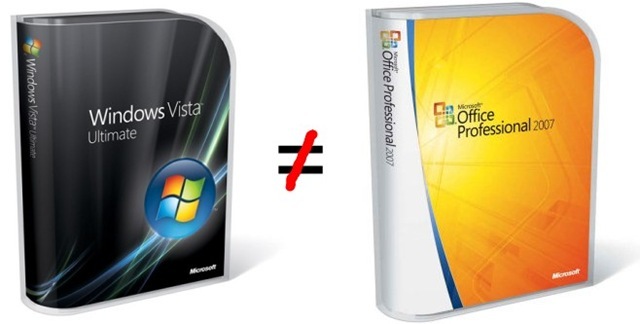 As it is, many folks upgraded to Vista and Office 2007 at the same time. The UI changes rocked their world a bit too much, and confusion set in. Just my $.02 here, and I personally really enjoy both products. That said, the average consumer can only handle so much change at one time. I was browsing Cnet today, as I usually do, and came across an article regarding the new desktop that will ship with Windows 7 next year. 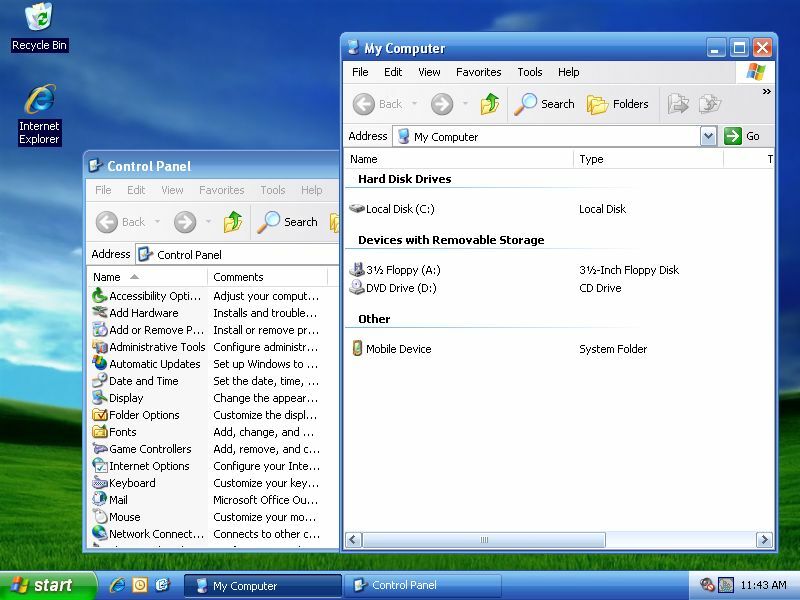 Part of the Windows 7 redesign is something touted as the “superbar”, that acts as the evolutionary upgrade to the taskbar that Windows has had for so long. The Cnet video bit on this is quite informative, actually, if you can handle the poor audio. I found it very interesting. But that’s not the problem. The problem is the feedback after the article. I gave up browsing to Cnet for a time primarily because the feedback would get me so riled up. Eventually, I went back to Cnet for the worthwhile tech news, but avoided the comments altogether. I should’ve kept doing that. Why? Because the fan-boy-ism gets out of control. Here we have a relatively lightweight look at the new taskbar (“superbar”) in Windows 7, and folks have to bust out the “Micro$oft copies Apple”, “looks like the OSX dock”, “blah, blah, blah” comments, that really accomplish nothing. Even more aggravating are the totally unfounded and untrue statements. Can we get something straight here? Large icons that launch programs were not invented by Microsoft, Apple, or anyone else that I can point to. Interactive “docks” or “launch bars” don’t belong to either of these organizations either. If anything, the “docks” that are so prevalent these days remind me of my time using Litestep back in the late 90s – before the Mac or Windows were using them! Perhaps they even carried over from some Linux variants. The “superbar” is not the OSX dock – they really handle things quite differently. Better? Worse? Heck, you decide – but enough of the useless fanboy comments. They’ve grown extremely tiresome. If you care for some well-written coverage of Windows 7, check out the iStartedSomething site. Good stuff! 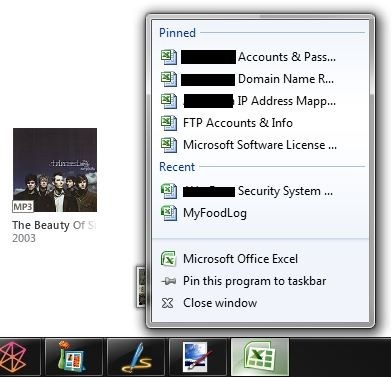 Let’s face it: the standard interface for Windows XP is starting to look pretty long-in-the-tooth. In fact, I’ve never been a big fan of it. That said, there are literally millions of users still working in XP every single day. Personally, I say “move to Vista”, but for those of you who can’t (or won’t) take the plunge, here’s an easy way to make your XP-erience just a bit nicer! Download the free “Royale Theme” for Windows XP. Click here to download the .zip file. Open the .zip (compressed) file and double-click the ‘Royale Theme for XP’ file to install. Keep all defaults and complete the setup process. In the Display properties, you should be on the Themes tab. From the Theme drop-down box, choose the ‘Royale’ entry and then click OK. Your interface will be quickly changed to start using the ‘Royale’ theme, which is quite nice looking, in my opinion. Note: You’ll also notice that your wallpaper is automatically changed. Head back into the Display Properties, choose the Desktop tab, re-select your previous wallpaper (or a new one, if you like), and click OK. Done. Subtle changes in some respects, but it definitely helps the XP interface feel more “fresh” and “current”. Again, my opinion. For those of you who are wondering about the origins of this theme, evidently it is an *official* Microsoft theme that was extracted from the ‘XP Media Center Edition’ install. Nice!